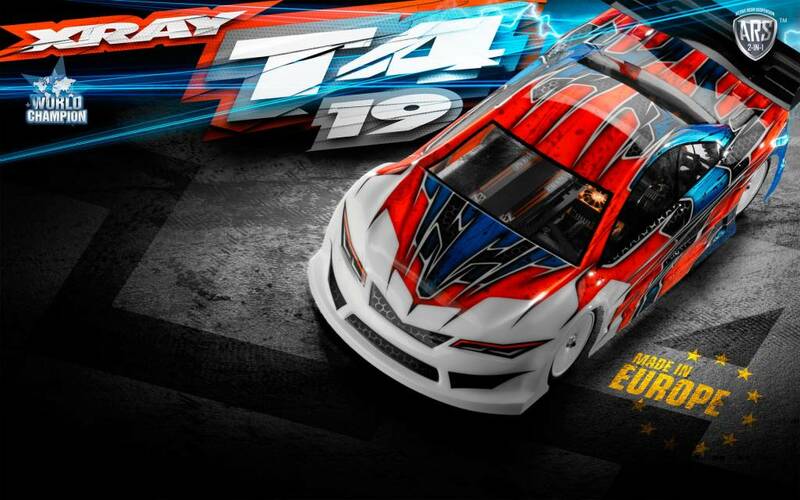 From national titles around the world… through ETS Champion titles… all the way to the European, Asian, and USA Championship titles… and the recent World Champion title, the T4 has an astonishingly long and strong history of victories to support the winning heritage of the XRAY T4 platform. In 2016, XRAY was the first team to sweep the overall championship titles in all three classes at the ETS, including 1/10 Modified, Stock, and Formula… setting a new record to beat! A year later in 2017 Team XRAY repeated its wins of both Modified and Stock classes, with Bruno Coelho becoming back-to-back ETS Champion in the Modified class and Alexandre Duchet winning the Stock class. 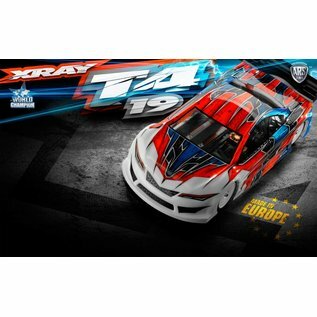 Now in 2018, Team XRAY repeated its dominant performance and won the overall ETS Championship titles in all three classes again: Modified, Stock, and F1. 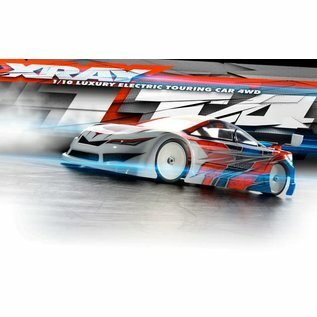 Since the release of the first XRAY touring car in 1999, XRAY has been a driving force in the 1/10 electric touring car racing scene. Continuous development and evolution of the XRAY product line has led to ever-increasing performance. XRAY’s commitment to craftsmanship, durability and performance is unsurpassed. Be part of the family, live the heritage. Designed, developed, and fully manufactured in-house at the XRAY factory in Slovakia, Europe, using the most high-tech German and Swiss machines and premium European materials, crafted with XRAY's legendary attention to detail by our artisan production specialists. The T4 is truly a masterpiece. The all-new T4’19 Aluminum Chassis was redesigned to accommodate a new front chassis brace. The front brace can be easily installed on the chassis to eliminate side flex at the chassis front, thus improving steering response and making the car more predictable. The 2.2mm thick chassis is CNC-machined from premium-grade Aluminum material. The chassis features pre-drilled holes for optional parts such as chassis weights, graphite motor guard, graphite adjustable battery holder. The ultra-narrow chassis is only 86mm wide with a variety of chassis flex adjustments that help to generate exceptional traction and give excellent steering characteristics. Optional aluminum chassis – available in either full stiff, flex, or extra-flex versions – allows you to tailor your T4 to particular track conditions. The aluminum chassis are CNC-machined from premium Swiss 7075 T6 aluminum, then black coated and laser engraved. The all-new chassis brace improves in-corner steering and makes the car more precise to drive. It is a great improvement especially at low- and medium-traction tracks where it significantly improves the handling of the car. Not recommended for use in high-traction conditions, as the extra steering may result in traction rolling. With the all-new BPA (Body Position Adjustment) system, the entire bumper area was redesigned to feature all-new upper & lower composite bumpers. An all-new foam bumper was redesigned to work with the new adjustable eccentric body posts as well as with the standard centric body posts. The newly-redesigned lower bumper has an updated shape with edges that prevent the bumper from touching the surface when the car is rolling. 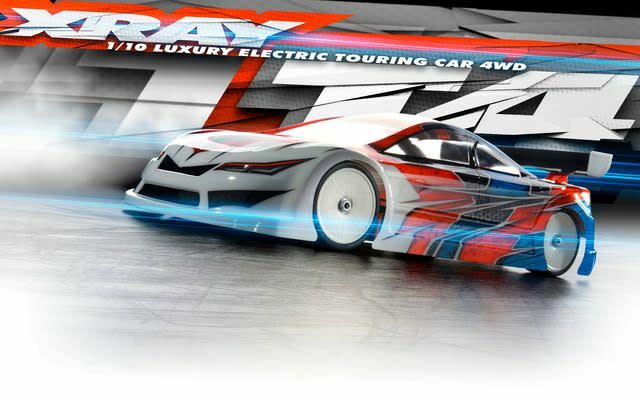 XRAY is in collaboration with MonTech to create a specially-designed, popular touring car body. The body is factory pre-cut with perfectly trimmed edges and optimal body post holes to fit the new XRAY T4'19 and maximize the benefits of the new BPA - Body Position Adjustment. The trimmed edges and post hole positions are the same as the XRAY factory team has been using, and the exact same that Bruno Coelho used to win the World Championship. All body post positions and trim lines were long-term tested by Alexander Hagberg, Bruno Coelho, Martin Hudy, Jan Ratheisky, and rest of the Team who have fine-tuned all three different body positions for different track conditions. The pre-cut MonTech body is available exclusively from MonTech. All-new upper clamps feature integrated centering pins to easily mount the graphite shock tower in the proper position, and more importantly these will ensure that the shock tower will not move in a crash and the shocks will remain in position. The upper clamps have been milled to remove unnecessary material to reduce their size and weight. Made from premium Swiss 7075 T6 aluminum, orange anodized. All-new ULP (Ultra-Low Profile) shock towers as well the SLP shock towers were redesigned to work with the new upper clamps with centering pins. The centering pins ensure perfect fitment of the shock towers in exactly the same position every time the shock towers are removed & assembled, helping to eliminate tweak or uneven spring pre-tension of the shocks. The all-new motor mount and layshaft bulkheads were redesigned to use smaller bearings on the layshaft axle, which prevents the bearings from touching the top deck when shims are not used under the top deck. The smaller bearings result in improved flex characteristics for the car. With focus on the smallest details and craftsmanship, the T4 bulkheads were refinished with stylish chamfered edges on all Swiss 705 T6 aluminum bulkheads. • Front of the FRONT suspension – 1-piece. • Rear of the FRONT suspension – 1-piece for stability, easy to drive in all conditions but especially under high-traction conditions. Optional 2-piece holders give increased in-corner steering, and are recommended for use on asphalt and low-traction track conditions. • Front of the REAR suspension – 2-piece for maximum rear traction. Optional 1-piece provides increased rotation of the car in high-traction track conditions. • Rear of the REAR suspension – 1-piece for more steering and better rotation. Recommended for high-grip conditions only, as it decreases rear traction. When using ARS™ suspension, the alu rear lower 1-piece suspension holder must be used with #302201 alu brace post for ARS™. Designed in virtual reality using the world's most sophisticated CAD tools, and manufactured using the world's best machining and molding machinery, the T4 achieves a level of perfection in all details that is second to none. The T4 is typical XRAY: ultimate professional, high-competition RC car for the most demanding racers, developed with attention to the finest detail, and backed by premium service & support…a luxury masterpiece. Team XRAY continues its winning streak at major international & national races all around the world! Just recently, Team XRAY added plenty of titles including World Champion, European Champion, ETS Champion, USA Champion and many more to the already impressive list of achievements, which includes more than 300 national titles from around the world, 45 titles from the USA National Championship, and multiple wins at other famous races such as DHI, TITC, LRP, IIC, ETS, Snowbirds, and many others. Be part of one of the most successful racing teams in the world! 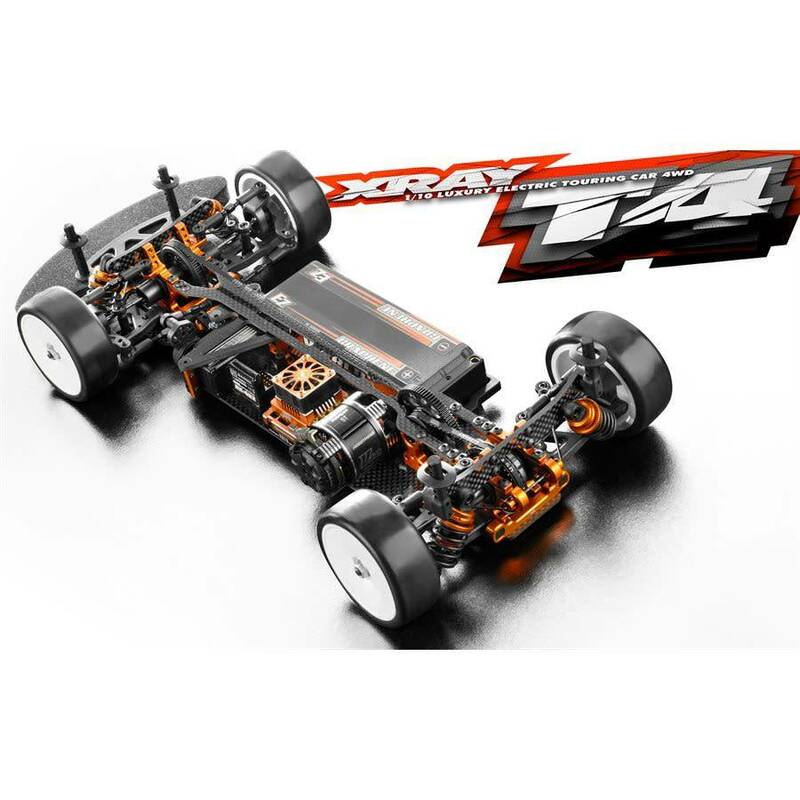 The T4 is synonymous with the absolute perfection that is XRAY: a platform that has been capturing trophies at tracks all around the world, and also capturing the hearts and minds of customers who demand nothing less than excellence. XRAY was the first company to introduce the SLP shocks which lowered the CG of the car. Since that time, SLP shocks became the industry standard that everyone uses. With ongoing development and pushing performance boundaries, XRAY designed all-new unique ULP (Ultra Low Profile) shocks which are 4mm shorter than SLP shocks, thus improving the stability of the car. ULP shocks were developed to lower the CG of the car even more to the absolute lowest to further improve stability. With ULP shocks the T4 stays flatter, making it easier to drive in chicanes and making it more resistant to traction rolling, letting you carry more speed through high-traction sweepers. Steering response and cornering speed are significantly improved as well. For very bumpy tracks, SLP shocks remain an excellent option. To lower the shocks, several parts were completely redesigned for the new ULP shocks. All-new shock bodies are CNC-machined from premium Swiss 7075 T6 aluminum and hardened to ensure maximum lifespan. The aluminum upper and lower nuts have a new lower-profile design, including new sealing O-ring and upper composite ball joint. All other shock parts remain the same and are fully interchangeable between SLP and ULP shocks. With an intelligent design, the full range of existing XRAY SLP springs may also be used in the new ULP shocks, so you can still use the entire range of springs from previous T4 cars. The pistons remain unchanged, and the set includes 3- and 4-hole pistons with 1.0, 1.1, and 1.2mm diameter holes. The pistons are molded using special processes and composites to ensure extreme roundness while maintaining maximum stiffness and durability. All-new redesigned top deck works with the new layshaft bulkheads and motor mount which moves the motor 1mm closer to the center of the car. The shape of the rear portion of the top deck has been specifically designed to achieve maximum traction and in-corner steering, and the shape allows for easy access to the pinion. The top deck is machined from premium-grade 2.0mm graphite. An optional belt tensioner can be mounted to the top deck. The XRAY In-Line Chassis Flex is very intelligent and is an extremely helpful set-up feature that helps to adjust chassis flex for various track conditions. With the servo mount and motor mount design, the chassis reinforcement graphite brace can be installed in 5 different flex adjustment configurations. The stiffer the In-Line chassis flex is set, the better the steering response as well as in-corner steering. From the narrow arms, through the tiny front and rear suspension blocks, to the small and robust steering blocks, every suspension part has been specially designed to provide responsive racing characteristics in all racing conditions. Over the years XRAY has successfully gained and utilized extensive suspension geometry knowledge and self-developed suspension stiffness technology, which have been utilized when designing suspension parts. The ultra-lightweight suspension parts are molded from a special composite material that makes the parts very light yet very durable to withstand the rigors of high-performance racing. The kit includes both standard and Active Rear Suspension (ARS™) rear suspension. ARS™ offers great adjustment possibilities and driving characteristics. ARS™ suspension consists of: suspension arms, graphite 0° C-hubs for optimal flex characteristics, hard steering blocks, and ARS™ linkages which connect suspension holders with the suspension block. The angle of ARS™ linkages –set by adding/removing shims on the suspension block and suspension holder – changes the toe-in characteristics of the rear tires during chassis roll. The included graphite suspension arms generate more overall traction, making the car easier to drive and increasing stability. The graphite suspension arms are included as standard parts, providing the best available performance straight out of the box. The specially-formulated graphite composite material results in a very lightweight suspension arm that can withstand the rigors of high-performance racing. Features include a single optimized shock mounting position and integrated anti-roll bar mounts. Different hardnesses of arms are available, each optimized for particular racing conditions. Innovative and unique SFA™ graphite stiffeners allow for super-quick suspension flex adjustment to easily adjust the traction of the car in various track conditions. Whether you drive in low- or high-traction conditions, with the smart graphite stiffeners you can very quickly adjust your car to suit it to current conditions. At the beginning of a race event when traction is low, the arms are used without the SFA™ graphite stiffeners. When the traction increases, the suspension can easily be made stiffer by mounting the SFA™ graphite stiffeners for more stability and easier driving characteristics. The graphite stiffeners give the car maximum stability in chicanes and allow for easier and smoother steering. The stiffeners are available only as an optional part. The C-hubs in the T4 are also carried over from the T3 platform and feature large openings for quicker & easier assembly/disassembly of the CVDs/ECS. The entire CVD/ECS assembly can be easily inserted/removed through the C-hub without the need for disassembly. The large openings prevent collision of CVD/ECS with C-hub in serious crashes. The C-hubs are available in all standard caster angles (2°, 4°, 6°) and are also available in 4 different hardnesses that are optimized for particular racing conditions. The steering blocks are available in three different hardnesses, which are optimized for particular racing conditions. Hard "H" rear uprights are included to improve the stability of the car and to increase cornering speed of the T4. The rear uprights feature 0° toe to ensure stability and prevent suspension geometry changes in hard crashes. There are two different roll center positions on the rear uprights, and roll center positions can be easily adjusted by adding shims between the upright and the turnbuckle ball joint. The rear uprights feature small but robust 5x10x4mm ball-bearings to minimize unsprung weight. The rear uprights are available in three different material formulations that were specifically blended for particular racing conditions. A medium “M” and graphite “G” hardness rear upright is available as an option. 1-hole uprights were developed as an optional fine-tuning part to compliment the standard 2-hole uprights for high-traction tracks where more roll of the car is desired. These 1-hole uprights provide an additional option versus the standard 2-hole upright when the outer hole does not allow enough roll, and the inner hole creates too much roll. The hugely-popular XRAY servo saver was improved and updated for the T4. Additional positions on the servo saver were added to make steering linkage adjustment easier. The servo saver consists of 4 springs which makes the servo saver strong enough to provide the precise steering racers demand, while still being flexible enough to prevent servo damage in hard crashes. The servo saver has interchangeable bushings to fit most popular servos. The top deck design allows installation of an optional aluminum stand which changes the car’s flex characteristics. By adding the reinforcement stand, the rear layshaft bulkhead screws are removed which generates more traction and makes the car easier to drive but results in more on-power push. Recommended for low- or high-traction conditions. For low- and medium-traction conditions, it is recommended to use the top deck without the aluminum stand. The ultra-efficient and well-proven drivetrain has been carried over from the T3 platform. The drive ratio is suitable for current high-performance brushless motors (stock or modified) and LiPo batteries. Both the front solid axle and the rear gear diff feature 38T pulleys and the central layshaft features 20T pulleys for an efficient internal ratio of 1.9. ECS drive shafts are 51mm long for optimized steering and stability. 50mm and 52mm ECS drive shafts are still optionally available to suit particular track conditions. The legendary XRAY ECS drive shafts equalize the speed between the drive shaft and the wheel. With a unique 2-piece joint between the axle and the wheel, an extreme wheel turning angle is divided into two shallower angles without causing binding. Regardless of cornering speed and wheel angle, the inner wheel will not bind or vibrate. Drive through the corner is more stable, more precise, and easier. Drive shafts are exclusively manufactured from special world-renowned, top-secret, self-developed HUDY Spring Steel™. The drive shafts are strategically lightened – see the hollow end of the dog bone – to guarantee the lowest possible weight without compromising strength or durability. These specially-lightened drive shafts can only be manufactured from special HUDY Spring Steel™ which was developed for extreme racing conditions. The drive shafts have been additionally hand. The T4 features 50mm long lightweight aluminum drive shafts machined from premium Swiss 7075 T6, hard-anodized and black-coated for stylish looks. The aluminum drive shafts are designed for use in the rear. To reduce rotating weight, the rear CVD drive shafts feature super-lightweight wheel axles which have the outer diameter specially ground to remove the material while keeping the same strength thanks to the use of HUDY Spring Steel™. The T4 gear diff increases on-power steering which is needed on nearly all types of tracks, and is ideal for both carpet and asphalt tracks. The gear diff includes a composite case and cover with pulley. Differential gears are made from tough composite material, precision-molded composite gears combined with light aluminum drive shafts, which create a lighter and super-smooth gear differential. Another key advantage of the gear diff is that it is maintenance-free. When the diff is correctly built, there is no need for maintenance for a very long time… no need for frequent oil changes, and no leakage due to the superior sealing system. Rotating mass is one of the most significant influences on the performance of an RC racecar. The T4 features a unique lightweight composite XRAY Front Solid Axle. The Front Solid Axle has a very stiff and ultra-lightweight structure that was achieved by molding the entire solid axle from XRAY's own self-formulated composite material. Outdrives are fully exchangeable which allows quick & easy servicing, while the unique drive shaft connection - eliminating the former drive shaft blades - enables direct power transfer to the axle and eliminates play between the drive shaft and outdrives, improving steering precision and increasing overall steering. The spur and pinion gears have been aligned along the absolute centerline of the chassis to optimize the placement of the polar moment and ensure ideal balance of the drivetrain components. The aluminum layshaft is strategically CNC-machined to minimize rotating weight without compromising strength or integrity. The hollow layshaft is perfectly round with zero run out, eliminating drivetrain vibration and producing a positive balance. Composite pulleys key solidly to the layshaft. The 2-belt 4WD drivetrain concept provides maximum efficiency and highest performance drive belts for ultra-high durability. Narrow (3mm) front and rear drive belts have been specially ground for minimal thickness and flexibility. With an intelligent design, the full range of existing XRAY SLP springs may also be used in the ULP shocks, so you can still use the entire range of springs from previous T4 cars. To make the car more stable and easier to drive under various track conditions, the 2.5C linear springs were chosen as the basic setting on both front and rear shocks. The 2.5C linear springs provide the best balance between steering, traction, stability, and response. As with previous XRAY designs, both front and rear bulkheads feature integrated belt-tension adjustment through the use of adjustable bearing eccentric holders, eliminating the need for a separate belt tensioner while reducing friction and improving drivetrain efficiency. Both front and rear bulkheads feature integrated belt-tension adjustment through the use of adjustable bearing eccentric holders, eliminating the need for a separate belt tensioner. The eccentric bushings allow also diff height adjustment. By rotating the diff eccentric holders, the height of the diff can be adjusted by 1mm. The wobble-free anti-roll bar system is mounted to the front & rear bulkheads via bearings from outside for extra-smooth movement and quick & easy changes and adjustment. The roll bar turns in ball-bearings for maximum precision and free movement. Anti-roll bar height is adjustable via a screw. The complete range of different anti-roll bar thicknesses is designed to work with the ball-bearing roll bar mounting system. Front 1.4mm and rear 1.3mm anti-roll bars are included as standard. Anti-roll bars have laser-engraved stripes (corresponding to bar thickness) for easy identification. A full set of 24 high-speed, blue-sealed and steel ball-bearings are used throughout the drivetrain, steering and anti-roll bars to ensure maximum efficiency. All of the bearings are degreased and oiled with Aero Shell® Fluid 12 for maximum smoothness and long life. The bearings used in steering blocks and uprights have been specially selected to reduce unsprung weight and maximize drivetrain efficiency. Aluminum adjustable turnbuckles used in the T4 are CNC-machined from 7075 T6 material with a stylish black coating. These turnbuckles are used for front and rear upright linkages as well as for the servo saver and ARS™ system. The aluminum turnbuckles are lighter than steel to help decrease the overall weight of the car. The T4 includes premium HUDY Graphite Grease which is a high-performance, advanced-technology semi-fluid lubricant which incorporates both extreme pressure additives and finely-dispersed graphite for load carrying. It is intended primarily for the lubrication of rotating parts and loaded gears. In addition to providing outstanding load carrying, it is formulated to have excellent adhesion and resistance to "fling-off" under extreme conditions. The grease reduces wear and increase the parts life. #106210 HUDY Graphite Grease. The extensive and impressive range of adjustment possibilities includes: ARS (Active Rear Suspension™), caster, camber, toe, anti-dive, anti-squat, ride height, downstops, track-width, lower roll center, upper roll center, roll center positions, steering roll center, wheelbase, Ackermann, optional belt-tension adjustment, adjustable shocks, adjustable in-line flex adjustment, adjustable front chassis flex, adjustable rear diff and adjustable optional front XRAY Multi-Diff™.